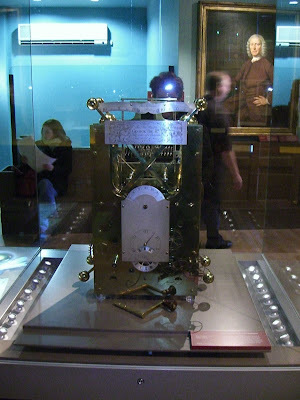 When I recommended Dava Sobel's book Longitude (read Unrecognized Genius), I promised that next time I'm in the London area, I'll go and visit the Royal Observatory in Greenwich, where most of the story takes place and where Harrison's clocks measure the time to this very day. Getting to Greenwich is an easy and cheap experience: go to Charing Cross tube stop, take the South East rail to Greenwich (3.2 GBP off peak = $6.5, 3 stops or about 17 minutes). 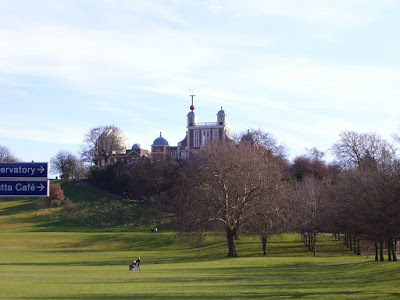 At Greenwich, you have 700 meters to walk, or a bus to take if it's too much for you. The Observatory is on a steep hill (accurately described in the book, for all the troubles it has caused) right behind the Maritime Museum. Both the museum and the Observatory visits are free of charge. 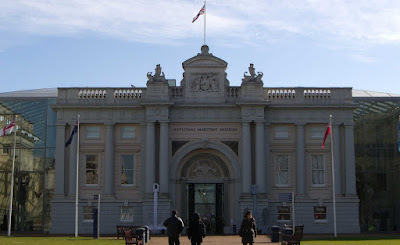 The National Maritime Museum contains all things you may wish to know about sea voyage, warfare and research - as befitting an island nation that depends on seafaring to survive. I liked the explorer tales, the uniforms and paraphernalia of navy officers, and the computerized re-enactment of Nelson's victory in Trafalgar. When you leave the museum (allow for 2 hours at least, if you're into it), a path will lead you up the hill to the Royal Observatory. The first Astronomer Royal was John Flamsteed, who had the position created for him. He also got a house (designed by Christopher Wren, the architect who designed St. Paul's Cathedral) and a lifelong stipend. The house still stands, and was turned into a museum. In the observatory itself, you can participate in interactive activities designed to teach you about the universe (the one I liked is where 3 people have to cooperate to create a space craft). 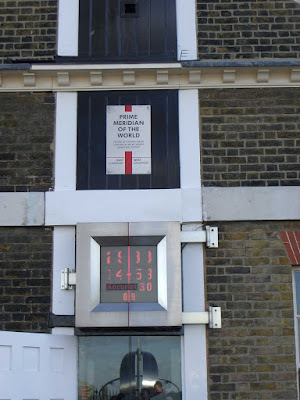 Leaving the observatory, you walk around the house and pass through a yard with a line on the floor - this is the Prime Meridian (Longitude 0, GMT 0). You can literally stand with one foot in the western hemisphere and the other in the eastern hemisphere. 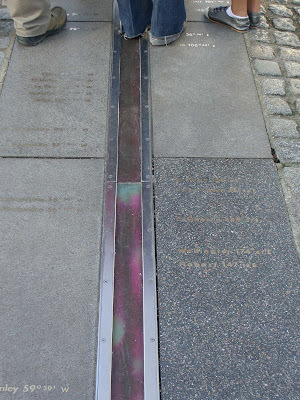 At night, the Meridian line is marked by a laser beam - would be interesting to see it sometime. From there, continue to Flamsteed's house, to see the clocks. 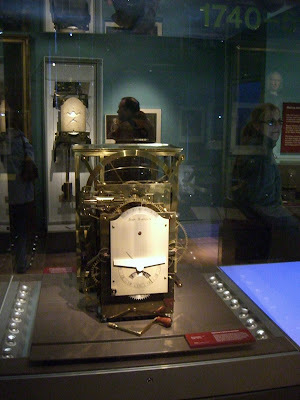 I saw 3 of Harrison's time keepers - H1, H2 and H3. 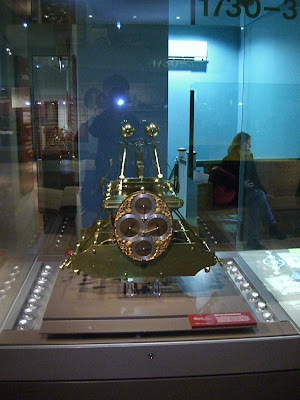 H4 is kept in another museum, but you can see a copy of it, called the K1 (read all about them in the book). The clocks themselves are amazing. The mechanics are more art than technology. And 300 years later, they still show the right time. Other than the clocks and the history of time keeping, you can read and learn about the great disaster (3 ships ran aground, 1500 men died) that started the Longitude Challenge that got Harrison to build his clocks. All in all, a great day, that ended with a great meal at the Chinese noodle place across the street and a short trip back to the hotel in London. You can see all the pictures I took here. And do yourself a favor, read the book!